A Colombian lawmaker has accused the army of murdering her brother and then trying to pass him off as a left-wing rebel killed in combat. 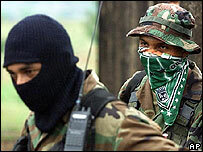 Eleonora Pineda claimed soldiers placed boots and a rifle on Mario Pineda's body to make him look like a guerrilla. But the military say he was armed and shot dead after opening fire on troops. Mrs Pineda, who backs official peace talks with right-wing paramilitaries, claims her brother was an innocent man killed because of her political stance. Mario Pineda was killed on Wednesday in a rural area near Tierralta, 450km (280 miles) north-west of Bogota. Armed forces chief Gen Carlos Alberto Ospina said a patrol was sent to the area following complaints that drug traffickers were extorting residents. He told local radio the soldiers came under fire from three armed men on motorcycles, and shot back, killing two of them, including Mr Pineda, 41. He said it was unclear whether Mr Pineda was involved in illegal activities but added: "The fact is, one of them started the shooting, firing at the soldiers." Mrs Pineda told local radio her brother was an ordinary businessman, who worked in the agricultural sector and was not involved in criminal activities.